Ecolect is a new website to help interior designers, architects, builders and homeowners identify and locate sustainable materials. "What makes something sustainable? Its recycled content? Its biodegradability? Its support of the local economy? Or, is it that it requires less energy than conventional products to make and transport? It’s some of these, and all of these. We’re still so new at creating and using sustainable materials, that there are no hard-and-fast rules for what makes something sustainable. It’s an evolving definition that we’re constantly revising as we learn more. In fact, even a 'sustainable' material may still have some negative qualities. So for now, our mission is to identify the best resources and technology for sustainability." 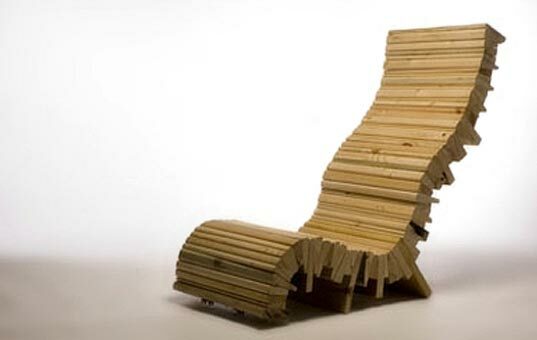 Claire Dianthos takes doors, beds, and gates, and other things and remakes them into chairs, stools, and other things. Once a Door was once a door. From Inhabitat.